Navy scientists working out of the Naval Surface Warfare Center, Panama City Division (NSWC) have successfully created a synthetic version of hagfish slime that has mechanical properties similar to Kevlar. Hagfish are an eel-like fish that dwell on sea floors scavenging for food, they also secrete a protective viscous slime when attacked by predators that Navy experts believe may help with ballistics protection. Hagfish slime is composed of a thread and a mucin, according to Dr. Ryan Kincer a Materials Engineer working at NSWC. The thread is said to be comparable to spider silk in that it is naturally occurring substance that could one day be used to replace synthetic petroleum-based products. Because of the comparable properties between hagfish slime thread and Kevlar — a material used in military protective gear, Navy experts see the potential for using the material to defend the fleet. 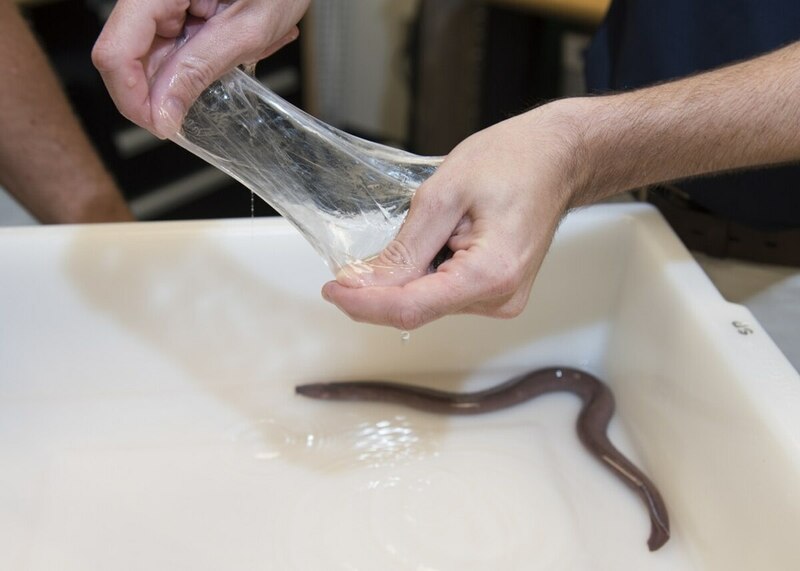 "The synthetic hagfish slime may be used for ballistics protection, firefighting, anti-fouling, diver protection, or anti-shark spray," said Biochemist Dr. Josh Kogot in a Navy press release. "The possibilities are endless. Our goal is to produce a substance that can act as non-lethal and non-kinetic defense to protect the warfighter." "Researchers have called the hagfish slime one of the most unique biomaterials known," said Kincer. "For the U.S. Navy to have its hands on it or a material that acts similar would be beneficial. From a tactical standpoint, it would be interesting to have a material that can change the properties of the water at dilute concentrations in a matter of seconds." Kogot and Kincer are continuing to expand their research to find new ways the material may aid the Navy, including strengthening its ability to attach to surfaces.